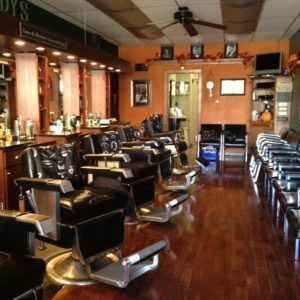 O’Grady’s Barber Shop is located in historic downtown Crystal Lake and was founded in 2001 by professional barber, Julia O’Grady. Julia opened her barber shop envisioning a place where a man could walk in and immediately feel comfortable and confident that he was about to receive old fashioned service and the latest cuts and styles. O’Grady’s is designed like a classic barber shop from years past, outfitted with vintage barber chairs and dark hardwood floors. It is a relaxing environment where old friends meet and new friends are welcome. We don’t take appointments, just walk-in when it is convenient for you. We take pride in providing you with the right solution for all of your grooming needs. Our skilled, all women barber-stylists are trained in cutting the latest hair styles including fades, flat-tops, tapers and of course the classics.